I started out to make this bag thinking it would be cute but not something I would carry around myself. I was really just doing it as a project option for Week 5 of the Learn to Sew series. But now that it’s done I am in love and I think I just might keep it for myself. 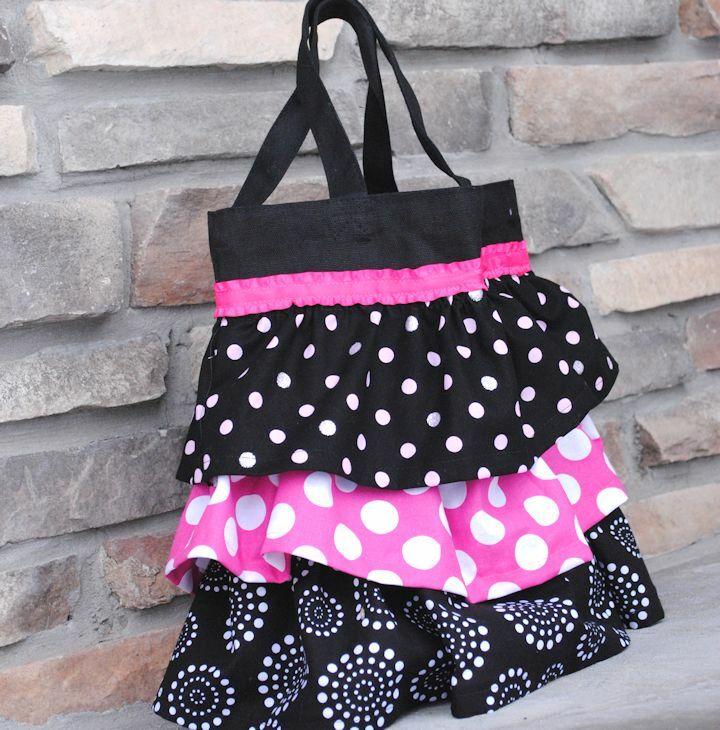 If you have a daughter I think it would be fantastic as a little dance bag or you could use it yourself for a library bag. Anyway, I’m pretty excited to show you this ruffle tote bag tutorial. 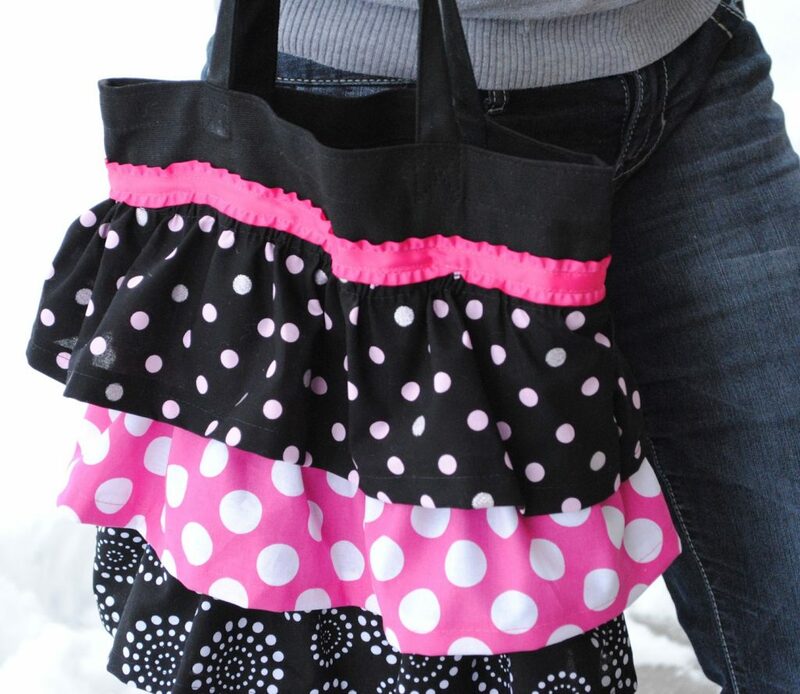 Three layers of ruffles on a cute little tote bag. And it’s got hot pink in it. And that makes me happy. But you can do any colors that you want! And guess what? It’s really not too hard to make at all. Bet you’ll wow people with this one when you are out on the town. OK, so enough talk. Let’s make this thing! 3 coordinating fabrics. You’ll just need about 1/4 yard of each. 2. Hem each fabric by folding under the long side (the raw edge) about 1/2 inch and then again about 1/2 inch and pressing it. Then straight stitch it in place. Do this on both of the long sides of all 3 pieces. 3. Now you are going to ruffle it. To do this, run a baste stitch along one of the hems you made then gently pull on the top thread and slide the fabric along it and gather it into a ruffle. (More about how to do this in Learn to Sew Lesson 5-coming next week). Gather it until it is twice the width of your tote bag or about 1 inch more. 4. Fold your ruffle in half with right sides together and sew the short end so that the fabric forms a loop now. 5. 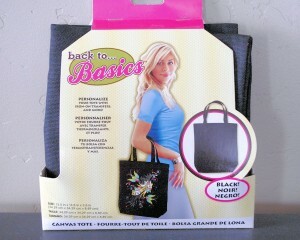 Slide your fabric onto your tote bag. For the bottom layer try to have it line up so that the bottom of the ruffle is at about the same level as the bottom of you bag. Pin it in place and then sew around the top of the ruffle. 6. Then slide your next layer on and do the same thing lining it up so that it overlaps the bottom layer but leaves several inches showing. Finally do the same with the top layer. 7. 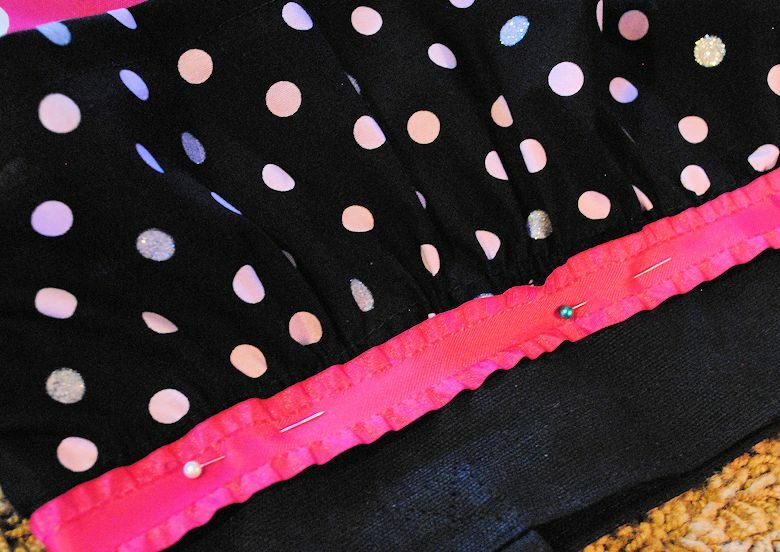 Then, pin your ribbon right over the top of your top ruffle (so that you hide the top edge of it). 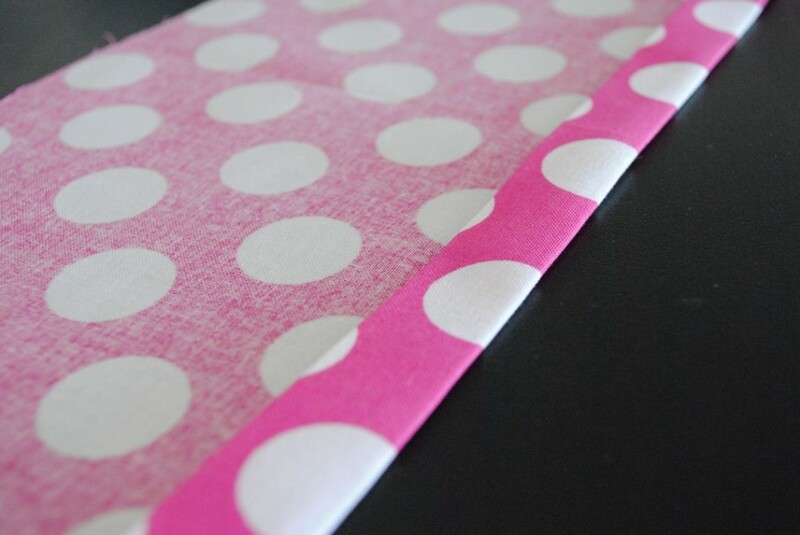 Sew that in place with a straight stitch at the top of the ribbon and at the bottom. And that’s it! You could add a little bow for embellishment if you want. Pretty great isn’t it? If you love to sew and craft, please subscribe to my blog on facebook, twitter, pinterest and by email! What is your policy on selling completed projects from your tutorials? Can you please send me some information on how you set up Etsy account? How much it cost? 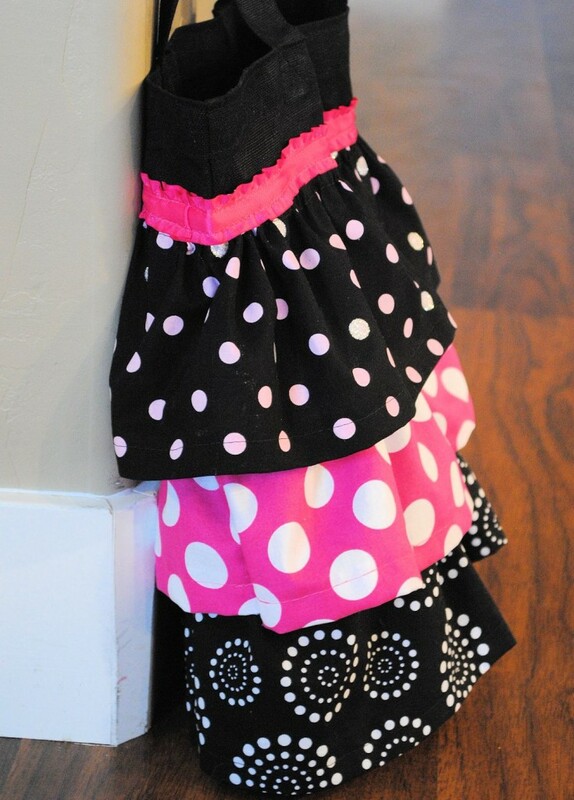 I love this idea i am thinking of making some for my grand daughters & maybe one for myself . I love this ! I will be making this after I make the project for week #4. Super cute bag! 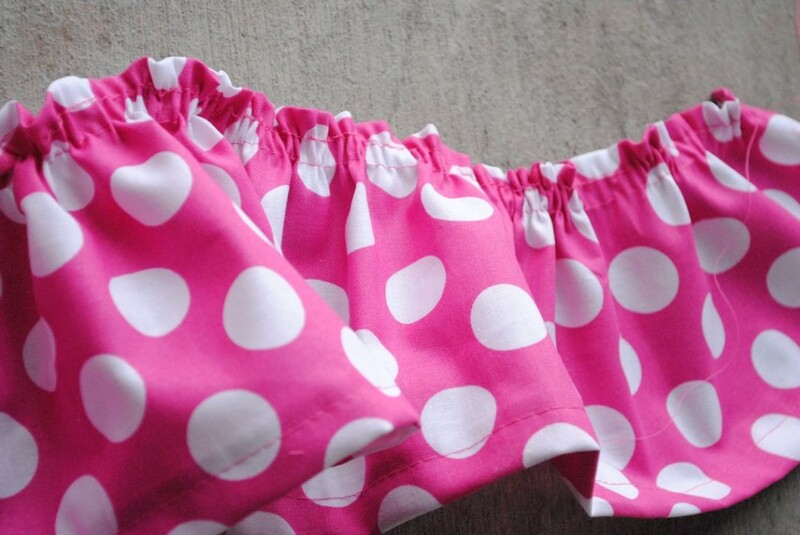 Ruffles, hot pink, polka dots?! Really, nothing not to like there =)!! This is super-cute! I just love it & can’t wait to make one. Thanks so much for sharing this! I love the fabric you used, ubber cute!! Oh, this is super cute! I am partial to hot pink as well :). I love the ruffles. Thanks for sharing at Hookin On Hump Day! Hi, found your blog on the Keep Calm link party. I also shared a bag. Great job! Janelle @Emmaline Bags. That is SO cute!! I am confused on how to get the bag situated where you can sew the ruffle on it, though. I was also wondering how you would position the bag so that you don’t sew the bag closed while sewing the 3 tiers of ruffles on it. I should have taken a picture of this for this bag. BUT, I do have it in this tutorial here: http://crazylittleprojects.com/2013/01/learn-to-sew-series-lesson-1-how-to-sew-a-straight-line.html. You need to take off the front part of you machine and sew like I am showing in that very first picture-the leg of the pajama pants. Do you see what I am talking about? 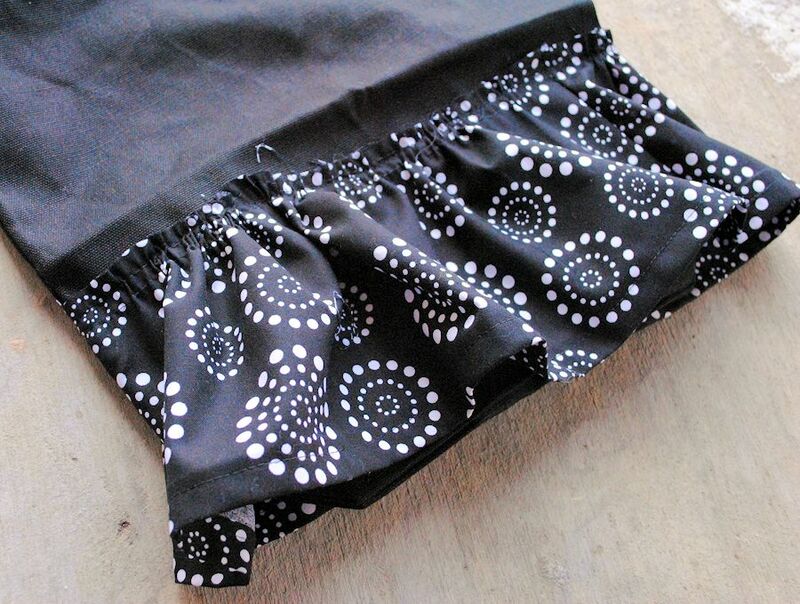 You can loop the fabric around your machine and sew it. Ohh.. hm.. my machine is built into its own table :/ There still has to be a way to do it, though, I would think? Definitely…but I don’t know. Good luck! My Mom is coming to visit in a couple of weeks, so I will ask her when she is here :D (She has a similar age machine, though hers does more stuff.) I will try to remember to post what I find out! Love this bag! Great for presents! I had a similar issue and found that I had to set my stitch length to a longer length. Only set the longer stitch length for the part that is for forming the ruffle. I think I set it to 4 from 2.5. I was able to create my ruffle without breaking the thread. I hope this helps. Oh my goodness! This is so adorable Amber! I have to try making one. Now I just LOVE this! I like this idea! it doesn’t take very much fabric either. My DD took one look at this and wants to make one. I think that we will sew our own tote bag to attach the ruffles to. It will be easier to attach the ruffles before sewing the bag together. Thanks for the cute idea! So cute! I love this ruffle bag. Thanks for sharing. LOVE LOVE LOVE the bag Amber!!!! I wish cottons ran 44-45 inches wide. Mostly seeing 42-43 these days. I would hate to have to piece it, but it is so cute, I’m going to make some. Thanks for sharing such a great tutorial! This would be a super cute halloween candy bag for my 2 yr old. When you fold the ruffle to form the loop how much do you fold under? Just enough to sew the two ends together? Yup! About an inch or half inch. This is just fabulous! I can’t wait to make a couple of these for my girls. You’ll want to cut them about 2.5-3 times the circumference of your bag. When you say hem, do you want the straight stitch on the bottom? Also, for the 2 baste stitches, do you do one on top of your hem stitch and one below? Or where exactly do you put your 2 baste stitches in accordance to your hem stitch. The hem is at the bottom and both of the basting ones are at the top-where the raw edge is. Thanks bunches for all the time that you’ve put into your site for all of us! Love the tote for my grands. The only problem I see for the new sewer is how to sew on the ruffle. I know that you sew in the round with only the only layer under the needle but the pictures look like you are sewing flat. I can see my self sewing the tote closed. I just made one! It turned out so cute. I made it for my seven year old. I’m making mine tomorrow. I’ll probably have to make one for my 5 year old too. Thanks for the easy and fun project. So it has been a really really long time since I’ve done any sewing, but I want to start making some of my own dresses and stuff and was just looking for a place to reteach me the basics quickly without too much detail so that I can just skim through, refresh myself, and apply my knowledge again. I know I am late to this blog and this series but it is really awesome. 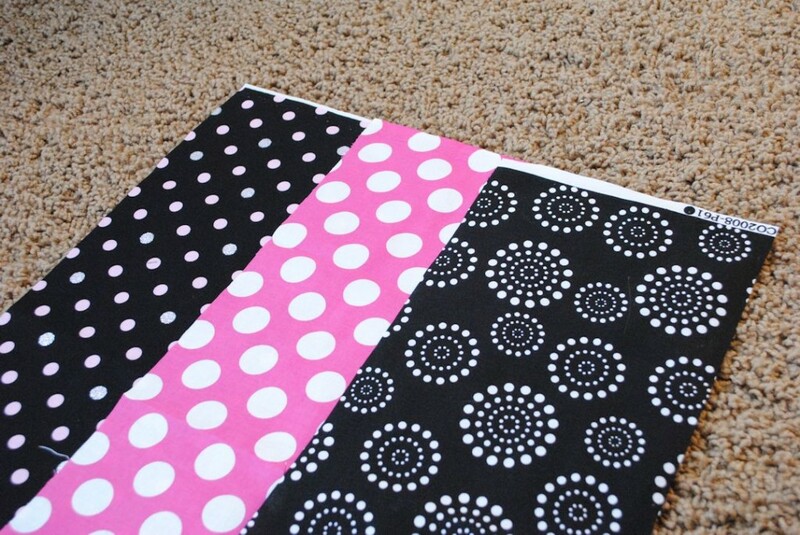 This is the first of your projects I’m going to do because I never did much ruffling and it is super cute. 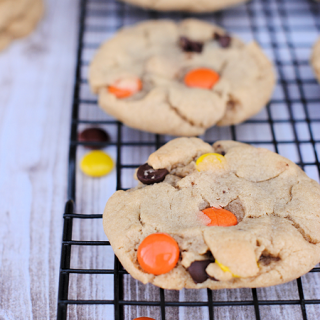 I am making a couple of these this evening and am super excited about it. I just really wanted to say good job on the blog. 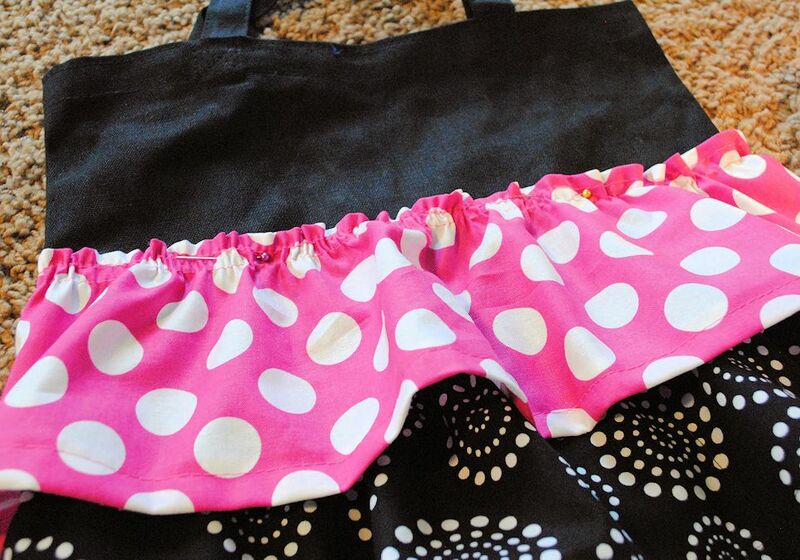 I made the ruffle bag with your step by step instructions and it was so easy to do. I had a ton of fun with it. I gave it away as a gift for my mom and am making two more for myself. Thank you so much for sharing your pattern and instructions. 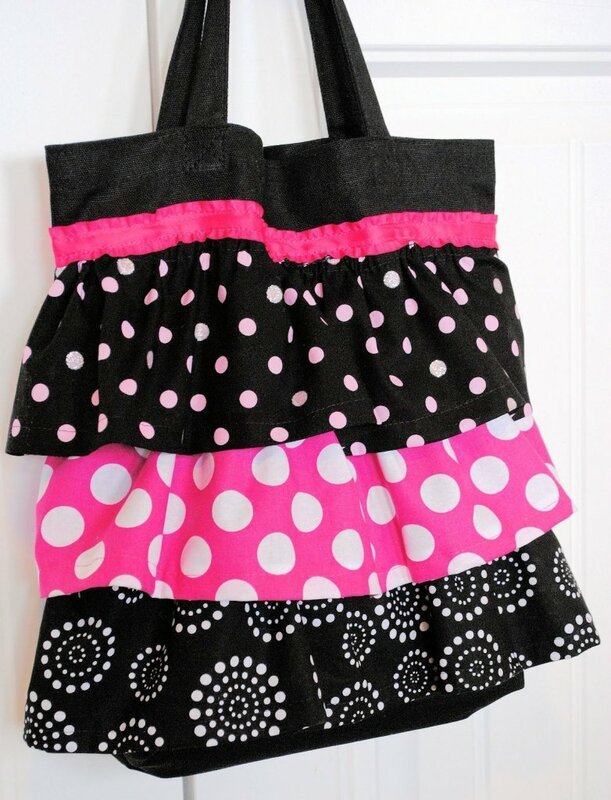 are you splitting open the tote bag to sew on the ruffles as I have found so many tutorials and they all show the tote bag intact and wondering how you are sewing on the ruffles without opening the side seams on the totes? No, just wrap the bag around the machine so that you are sewing through only one layer of the bag at a time and can go all the way around it. Just saw the answer to the question I had about sewing the bag together when putting on ruffles! Yay! Now I can get to work…..thank, thank you, thank you! 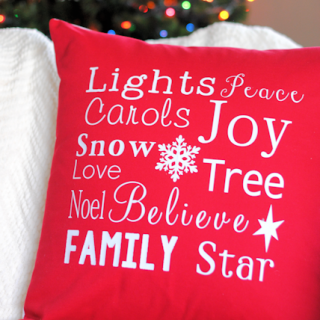 I love your projects…..all of them! 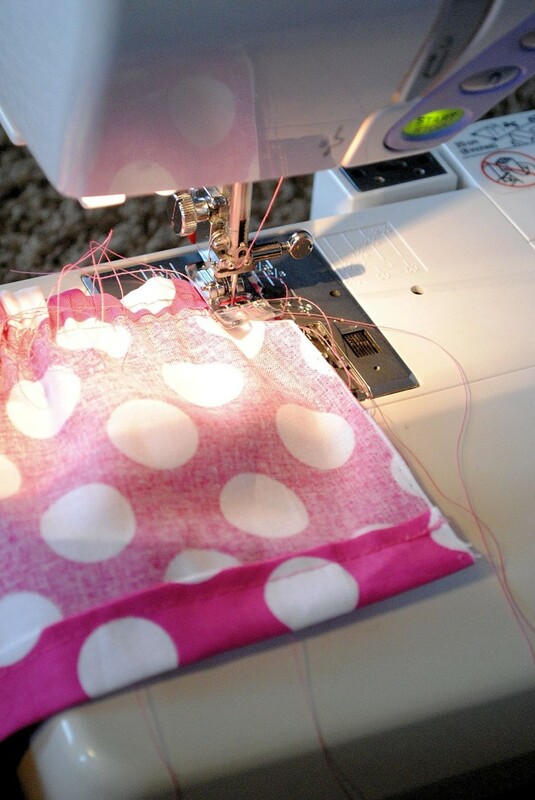 I just feel bad because you don’t have a little girl to sew for….:(. Oh well. You have proven you can sew for boys, too! Did you pin it a lot? I would say make sure you have pins all the way across it to help hold the ruffle in place. Can this be done without an sewing machine? I can sew pretty good but must say am IN LOVE with this tote. Thank you so very much. Karen Carroll Clark. You definitely could, just more time consuming. im trying to embellishing an existing bag. It is 24″ around and 5″ long. Can you help me adjust the amount of fabric? I’m new to sewing. Thanks. Love this tutorial. Made one for my granddaughter gave as Christmas gift. Embroidered her name in space on top. She loved it. Wish I had pictured it but, I didn’t. It turned out real cute though. Will most likely make more. So glad you enjoyed the tutorial!